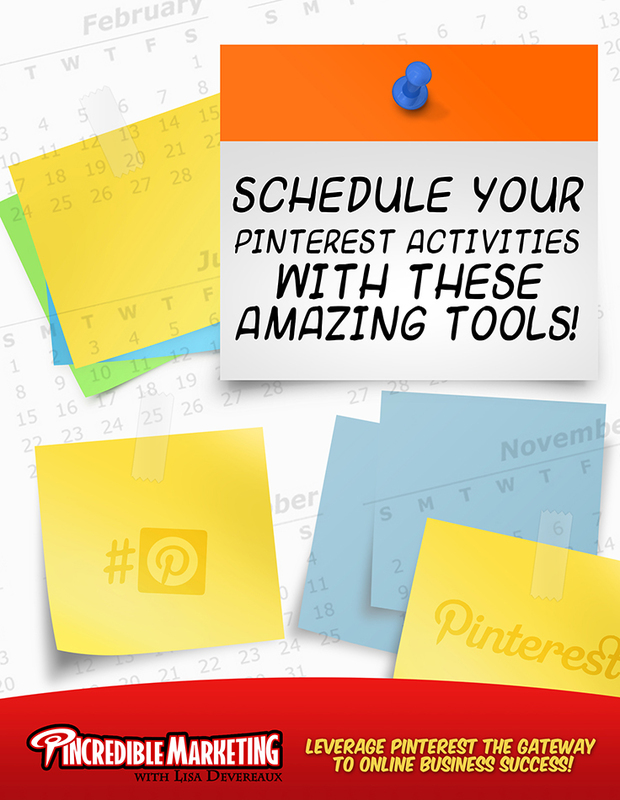 Schedule Your Pinterest Activities With These Amazing Tools! If you’ve been pinning for a while, you must already know how vulnerable you can be to a pinning spree, and before you even realize it, you are way past the half hour you had allocated to update your brand page on Pinterest. Pinning anything you find attractively relevant, is not only bad business time management, but a potential reason why your followers may start feeling overwhelmed! You don’t end up overwhelming pinners by inundating their Pinterest feeds with your brand-centric images. This is not an effective strategy anyway, and will only annoy them, or more likely convince them to ‘unfollow’ you. By distributing your pinning activity over different time slots, you will have a better chance of having your images repinned, instead of getting them all dumped in a sitting. If you really believe that “timing is everything”, then let it apply to your pinning journey as well! In spite of having the best images, not pinning them in the right volume, and at the right time, may not get you the repins and fan base that you are hoping for. Let’s face it, no one stays glued to their desktop or tablet screens all day, so the best way to optimize the visibility and reception of your pins is to invest in a scheduling tool. Have a look at these three amazing scheduling tools for your Pinterest activities that can really help you manage your business time better. Although GoPixel faces certain issues in retrieving data from Pinterest, similar issues are faced by almost all the other third party Pinterest tools. However, that being said, the brief method and minimal information requirement makes this scheduling tool extremely easy to use. With GoPixel, pinners can add website URLs in the description fields as well as schedule their pins to a group board. Begin with adding GoPixel’s bookmarklet tool to your browser, which will allow you to pin content from any website. Click the “Add New Pin” option, and either upload an image, or select one from a website. After you choose “Schedule”, GoPixel allows you to customize the date and time you would like your pin to be published at. Once done; click “Pin it”. You can go to “My Pins” to track your scheduled pins or choose to “delete” them. A major glitch GoPixel users face is that it does not allow you to edit any scheduled images, and therefore, you will have to delete a pin and start again if you need to edit any parts of the graphics or the description. As a very basic and easy-to-use tool, ViralTag (formerly Pingraphy) is a good start to get the hang of scheduling. Although it’s not very attractive or intuitive, neither does it allow pinners to upload original pins or schedule repins; ViralTag can prove to be a great scheduling tool to pin and schedule images from other websites. On ViralTag, you can either upload your images, or visit the website containing the image you wish to pin and then use the “ViralTag” bookmarklet. The rest of this guide focuses on the second option for scheduling. Choose your required image by unchecking those you don’t want, and click “Next”. After you have chosen your board, select “Bulk Update” to open the field and fill them in with the description and URL. When done, click ‘Schedule’. ViralTag presents you with a ‘Start Time’ option to specify a date and time to publish your image on Pinterest. Click the empty box under the option to gain access to a calendar and choose your preferred date and time. Click “Done”. Pinterest-friendly Tip: Schedule your pins every 30 minutes! Unlike GoPixel, you can use the edit button in case you need to edit the description field, and click ‘Save’ after you’ve made the changes. Owing to its advanced analytics and glitch-free scheduling tools, Curalate is considered a definite step up from ViralTag (or Pingraphy, as you like it!) by Pinterest gurus. Unlike its less pretty equivalent, Curalate works proficiently for voluminous brand pages and heavy pinners. What sets Curalate on the top of the scheduling game, is that pinners can edit all of the scheduling details, including the URL, from their dashboards, instead of only being able to access the board titles or dates/times to publish their pins. Another advantage of using Curalate is that it can show you which other social networks are driving your targeted traffic by tracking pins from Facebook Likes and popular tweets. Fantastic! Look out for an email from Me. Nice Post Lisa! I found a new Pinterest tool called http://socialpilot.co it’s pretty useful for scheduling Pins on multiple Pinterest accounts. However, it is affordable to schedule your pin for future sharing and offers many more useful features as well. Download my eBook and receive the latest tips and strategies on leveraging your Business with Pinterest. Visit Lisa Devereaux | PinCredible Marketing's profile on Pinterest. 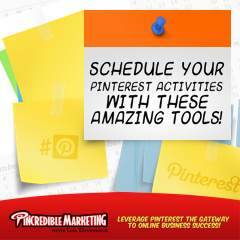 Monica on Schedule Your Pinterest Activities With These Amazing Tools! Digisha on Schedule Your Pinterest Activities With These Amazing Tools!